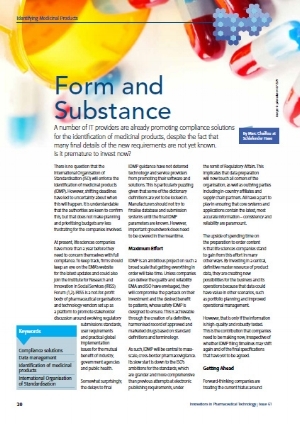 A number of IT providers are already promoting compliance solutions for the identification of medicinal products, despite the fact that many final details of the new requirements are not yet known. Is it premature to invest now? There is no question that the International Organisation of Standardisation (ISO) will enforce the identification of medicinal products (IDMP). However, shifting deadlines have led to uncertainty about when this will happen. It is understandable that the authorities are keen to confirm this, but that does not make planning and prioritising budgets any less frustrating for the companies involved. At present, life sciences companies have more than a year before they need to concern themselves with full compliance. To keep track, firms should keep an eye on the EMA’s website for the latest updates and could also join the Institute for Research and Innovation in Social Services (IRISS) Forum (1,2). IRISS is a not-for-profit body of pharmaceutical organisations and technology vendors set up as a platform to promote stakeholder discussion around evolving regulatory submissions standards, user requirements and practical global implementation issues for the mutual benefit of industry, government agencies and public health. Somewhat surprisingly, the delays to final IDMP guidance have not deterred technology and service providers from promoting their software and solutions. This is particularly puzzling given that some of the dictionary definitions are yet to be locked in. Manufacturers should not try to finalise database and submission systems until the final IDMP parameters are known. However, important groundwork does need to be covered in the meantime. IDMP is an ambitious project on such a broad scale that getting everything in order will take time. Unless companies can deliver the quality and reliability EMA and ISO have envisaged, they will compromise the payback on their investment and the desired benefit to patients, whose safety IDMP is designed to ensure. This is achievable through the creation of a definitive, harmonised record of approved and marketed drugs based on standard definitions and terminology.